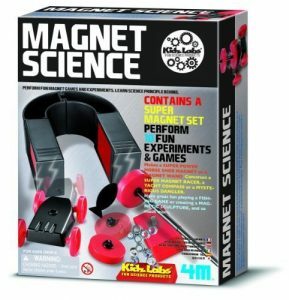 4M Magnet Science Kit Deal On Amazon! I love doing projects at home with my kids that will be fun and they will be able to learn something! This is a fun it to grab. The Magnet Science Kit teaches young scientists about the effects of magnetism through a combination of fun science experiments and games. The kit contains materials to make interactive magnetic objects like the Super Power Horseshoe Magnet and the Magnet Wand. Construct Super Magnet Racer, a Yacht Compass, or a Mysterious Dangler. Activities like the Fishing Game provide hours of fun and provide hands-on learning about the effects of magnetism. My Grandson always loved playing with magnets. This is really neat. A fun, educational toy.